The mushrooms made me smile, too, Mary -- I ate the fourth cake! I love spinach! (and have polished up some Stouffers spinach souffles in my time). I will definitely do thias - and put the smiling mushrooms in the middle. Yes, I'd almost go for spinach over icecream too. Liking your flavour combos - nutmeg is fantastic with spinach. OMG, I have to make these. They look awesome, and I would have never thought to make anything like this. Smile. It is always so much fun to read about the little things that bring joy into our days...the foods that aren't the most glamorous but always make us feel safe and warm. And I loved this great recipe you shared with us. I'm a huge fan of spinach too, so I'm eager to give this a try. Thank you for sharing all of this yumminess. I hope you have a great Friday. The weekend approaches! 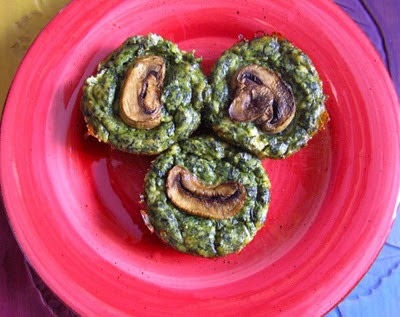 Rosemary-Your spinach cakes are a vegetarian's dream...not that I am, but my son, and his wife are, and they are always asking me to make something good with spinach, when I cook for them. This is it!...so pretty, and over the top delicious! Also, in your previous post, I am drooling over your bread pudding with the vanilla sauce. Yumm! Thanks for sharing your amazing dishes, and desserts...have a wonderful weekend! Brilliant idea! They are so easy that I could make a few of these next time the oven is on and take them with me at lunch time. Thanks.